Race Horse Company are an all male Finnish Contemporary Circus Troupe created in 2008 with an aim “to take over the world” and after what I saw last night I think they actually can! 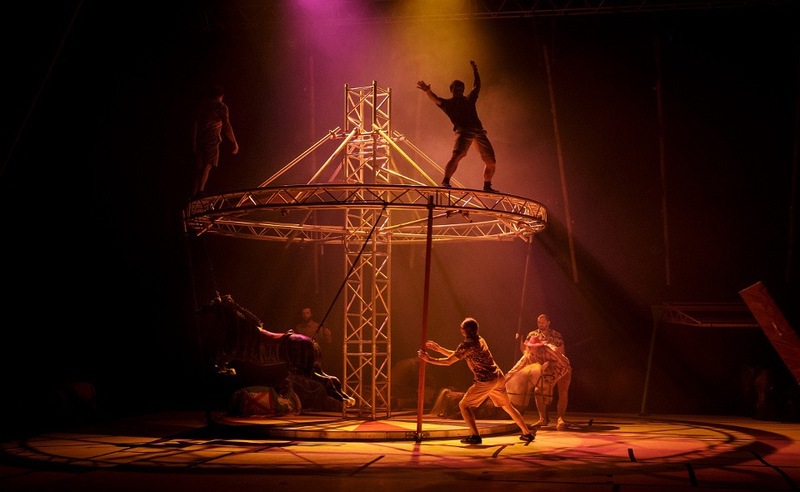 Race Horse Company turned the Theatre Royal stage into an abandoned fairground and proceeded to run riot on the equipment that was left there. Combined with the music they used, it gave the air of some guys coming back from a rave and happening upon this equipment. For me this added to the nervousness of the performance – I am aware that they are highly trained very skilled professionals, but their characteristics when interacting with each other sometimes suggested otherwise. From swinging around on an old carousel to testing their strength with a large hammer the show starts off quite simple, but I was still on the edge of my seat the whole time! Each performer had a fluidity and grace that was beautiful to watch, showcasing their individual talents before coming together as a team. The performers are constantly engaging with the audience; even just the raise of an eyebrow would raise a nervous chuckle from the audience, as we had no idea where they were going. This would soon be followed by gasps as they would complete another madcap stunt obviously totally in control but performed with a carelessness that added to the characters they were portraying. Beautiful synchronised trampolining, bouncing capoeira on inflatable balls and a very scantily clad human catapult all lead to the final sequence with the Wheel of Death, which is indeed death defying, with members of the company switching in and out whilst the wheel is going at full speed, all the while maintaining the grace and skill you have come to expect them throughout the show. I think I ended up watching through my fingers at some points in this finale. Quirky edge of your seat fun, with a dash of seriousness blended seamlessly in, I would recommend joining their mailing list should they have one to keep an eye out for when they are next performing in the UK, as they are not to be missed. Previous Post Summer. Autumn. Winter. Spring.